Plot: Without giving anything away, the film is based on the real events of the Claus von Bulow attempted murder trial. The main character, Claus, is an unlikable European cad who is being tried for the attempted murder of his rich wife. The film follows the story from pre-trial to post-trial. Why you should watch it: There are many reasons to watch a film like this. First, it's based on a true story. The accusation and trial of such a ready-made villainous type is tough to ignore. Real life is sometimes infinitely more interesting than anything that Hollywood can create. This is one of those times. We are a voyeuristic society and we enjoy watching people crash and burn. Claus von Bulow was ripe for the fall. Second, I'll watch anything with Jeremy Irons in it. If he was hosting a special on the ins and outs of a 1040 EZ form, I'd watch it. There's something incredibly off-center about him. He's like the creepy European who comes to the American beaches and wears a tiny Speedo while ogling married women and drinking a martini. He has the perfect villain's voice too. That goes a long way. It's difficult to think of Irons in a heroic role, but if he were to be cast as a hero, I'm sure I'd watch. He portrays Claus von Bulow with all the slimy, smarmy, disaffected, cold, and unlikable charm one could hope for. It's no surprise that he won the Oscar for Best Actor. Third, people love a good crime or trial film. Regardless if the viewer already knows the outcome, sometimes the journey is worth it. Everyone knew that Tom Cruise (ugh) would be victorious in A Few Good Men, but nobody seemed to mind already knowing. With Reversal of Fortune, there's always the lingering question of, "Is he guilty?" Barbet Schroeder does a fantastic job of keeping the audience interested and wondering of what the outcome will eventually become. Finally, the film is just one of those forgotten classics. Have there been better trial films? Absolutely. 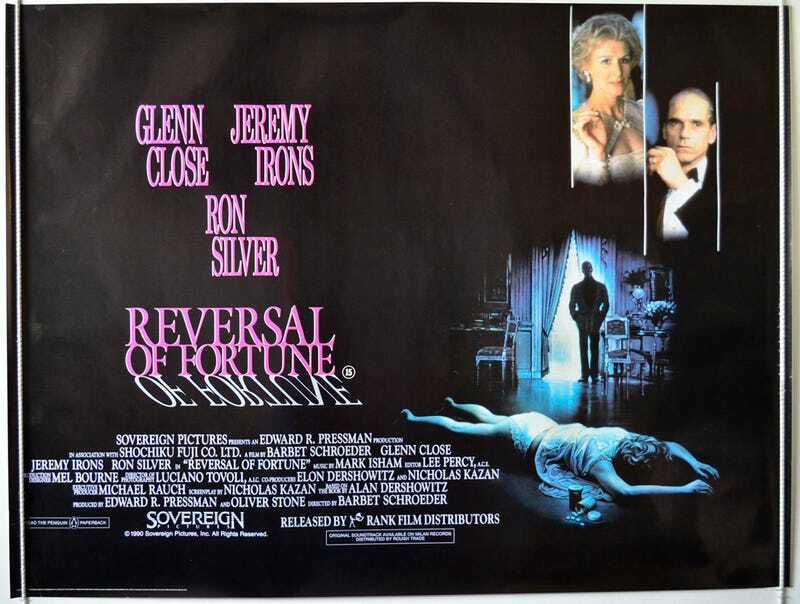 Reversal of Fortune, however, should always be in the conversation of great thrillers. From the very opening scene to the last (which is one of the greatest character-based end-scenes you'll ever see), this film is a captivating piece of cinematic pleasure. I can't recommend it highly enough. If you've got nothing better going on, give this film a look. You won't be disappointed. Let me know your impressions in the comments. The trailer doesn't do much by way of engagement, but trust me - the film is worth it.